Magic, mystery and brilliant big wins are all waiting to be uncovered on the reels of the brand-new Holy Diver online slot by Big Time Gaming! Collect gems and set off on an adventure you'll never forget. 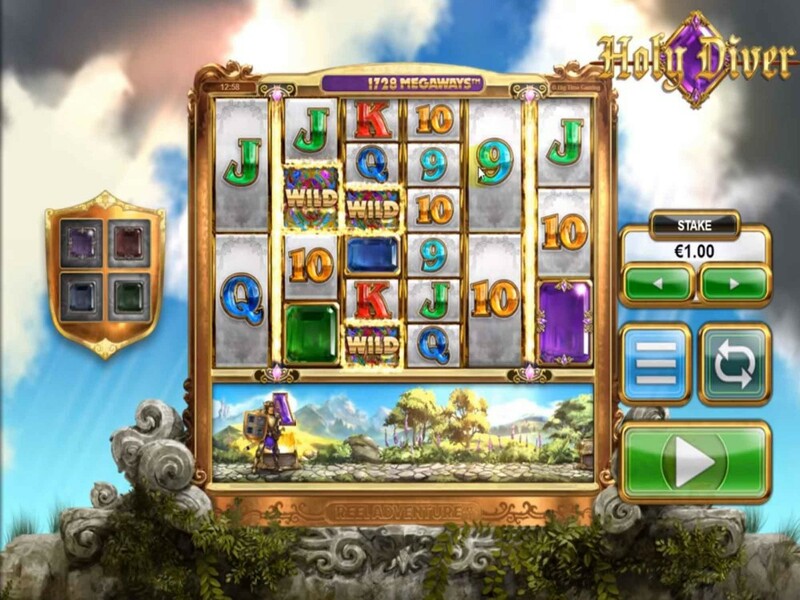 Do you enjoy the wonder and magic of mediaeval fun while also enjoying the chance to spin the reels of an online slot? Big Time Gaming has created an exciting and unique new casino game that will tick every box with Holy Diver MegaWays! The perfect combination between Online Slots and an adventure platform game, you'll be sent on a special mission across the bottom of the game board while racking up big wins on the reels. If variety is what you're searching for, it doesn't get more exciting than Holy Diver! Designed with 5 reels, this MegaWays slot provides the opportunity to unlock up to 586,971 different paylines! With that many paylines potentially on offer, you'll have a mind-blowing number of winning combinations waiting to be triggered! When the game loads for the first time, you'll have a grid filled with stone symbols and gems to enjoy. On the lower section of the reels, you'll spot a brave knight ready for a journey with the title Reel Adventure stamped below it. Start off with "Level 1: Race for the Morning" when you place your bet. You can either place for as little as $0.10 per spin or as much as $20 per spin to make things interesting. As you hit the SPIN button, the knight will move along the side-scrolling adventure section at the bottom of the screen. Reach the chest and the knight will kick it open to reveal a winning combination or a special symbol (such as a Wild) to help fill your bankroll! No matter how you choose to play, either via your desktop or your mobile device, the excitement of essentially playing two games at once never gets old! Holy Diver MegaWays has so much to offer with every spin of the reels, so be sure to keep your eyes peeled for one of the following awesome features! ✓ Chests of Fortune - As you reach the chests locked below the reels, your knight will open them up to reveal one of four different bonuses. Cash in on the Standard Symbol Bonus to have one of the selected symbols transformed into a Wild. If you trigger the Sword Bonus, up to 3 full reels Wilds will contain a multiplier of up to 5x your bet! The Fireball Bonus will add up to 4 flaming Wilds on the reels. Last, but not the least, the Gem Symbol Bonus will reveal hidden gems to add Wilds or Multipliers to the reels. ✓ Free Spins - A total of 10 free spins will be added to your account but depending on the level achieved, you could receive up to 3x the Wilds on the reels! The more Wilds you have to play with, the better your chances of creating bigger and better combinations. ✓ Diamond Retrigger - During the Free Spins round, the brave knight exploring the realm will collect diamonds. The more diamonds you collect, the better the special reward will be that you uncover. Enjoy extra spins, extra free spins, and a free retrigger. Be astounded by this brand-new Big Time Gaming release and set off on your own adventure filled with intrigue and epic rewards!